Think that carnivals are just for the kiddos? Think again! At Celebration Source, one of the perks of our job is being able to witness the radiant smiles on the faces of all that attend our events. And that goes for the young ones and adults alike! There is just something magical about walking around with some fluffy and delicious cotton candy, listening to the screams of joyous glee as people soar high above the ground on one of our large rides, or attempt to win prizes at our outdoor party games. While we do provide carnival rentals in West Miami for those of the younger crowd, we’ve found that the more seasoned guest smiles the widest. That’s why along with community festivals and special events, we also throw corporate events to bring your employees together. Because what is a better thank you for hard work than a carnival? 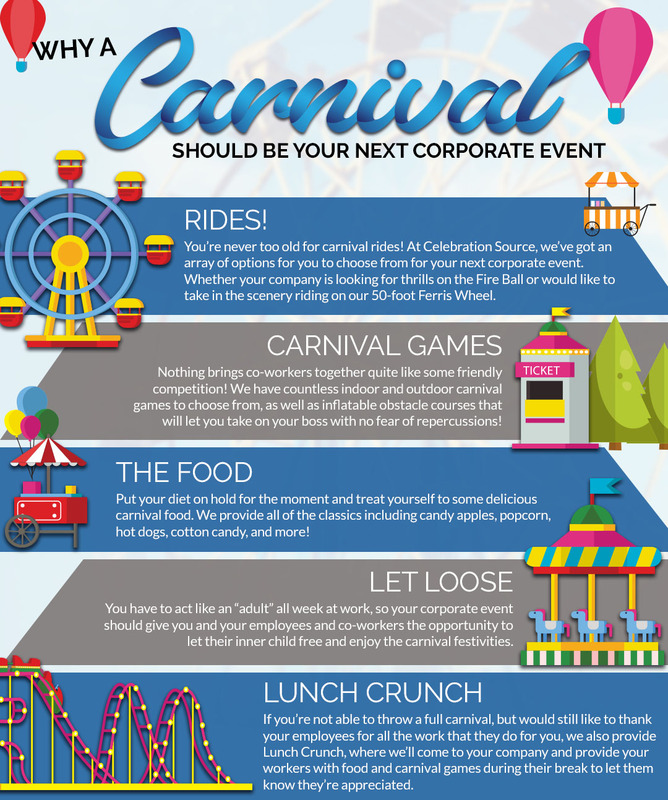 Let’s take a look at a few of the benefits that come with renting our carnival rides, food, and games for your company and staff. Growing up is not a requirement. Sure, you have a job to help pay the bills, you keep a close eye on your nutrition, you shave — but where is the rule that states that just because you’re older you can’t let loose and free your youthful spirit? Work can be tough, so you and your employees deserve a break to chow down on some corn dogs and race through some inflatable obstacle courses. There’s a misconception that corporate events need to remain “corporate” in nature. Maybe a couple speeches, some bland “adult” food, and suits and ties. We say that’s hogwash! Nothing will bring the employees together quite like some exhilarating rides and compete against one another in classic carnival games. Everyone can grow back up when Monday comes around, but at least for a little bit, all they should have to worry about is having fun! That goes for your diet as well! 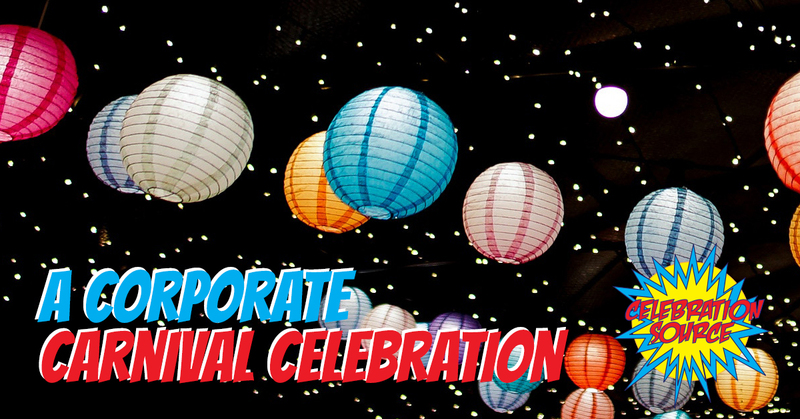 Kale and spinach smoothies can wait, but at your corporate event, be sure to indulge in some carnival classics such as candy apples, popcorn, cotton candy, hot dogs, and more! Thanking your employees for all that they do shouldn’t just be a once a year event. It’s important for them to feel wanted as well as work on communication with their co-workers. That’s why we also provide Lunch Crunch, where we come to you and provide carnival food and a variety of games and fun activities while they’re on break. Your employees not only build up their work relationships but will also feel appreciated which leads to more productive workers. As your source for carnival party games and entertainment services for the past 25 years, we know how to throw a carnival. If your company is brainstorming ideas for your next corporate event, don’t lie to yourself and say you’re too old for a carnival! 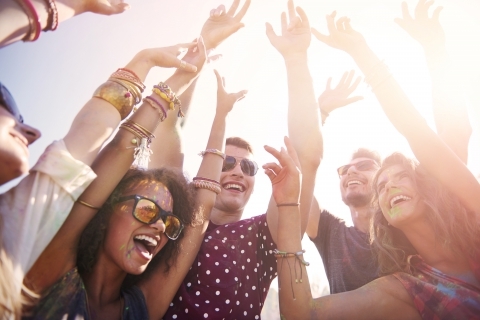 The magic never fades, and every single one of your employees will have the time of their lives. Get a quote today!